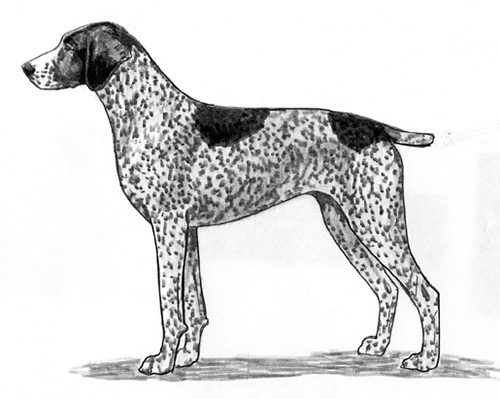 A Continental pointing breed that is descended from the old French Braques, which were combined during the 19th Century with the orange and white Southern Braques to give them more lightness and activity. A few huntsmen from the Ariegeois region continued to use the breed, which saved them from extinction. In 1990 a team of breeders decided to devote themselves to the breed’s survival. The Braque de l’Ariege was recognized by the United Kennel Club in 2006. A powerful, robust, strong dog with lean legs, prominent muscles and well defined lines. The mottled white coat and good size of the breed give it an elegant, distinguished look. Docile, easy to train and adaptable to all kinds of hunting. Long, angular and narrow at the zygomatic arches. The top lines of the skull and muzzle are slightly divergent. The skull is slightly longer than the muzzle. It is very slightly rounded, with a lightly accentuated frontal furrow. The occipital protuberance is quite pronounced. The stop is slight. Long and straight, sometimes very slightly convex. It tapers in width slightly from the eyes to the nose. The lips are hanging and quite fine, with the corners folded but not drooping. The Braque de l’Ariege has a complete set of evenly spaced, white teeth meeting in a scissors or level bite. Pink, flesh colored or pale brown, depending on the color of the coat. Never black. The nostrils are well opened. Disqualifications: Black nose. Split nose. The eyes are well open, slightly oval in shape and fairly deeply set. The expression is gentle, frank and intelligent. The iris is dark amber to brown, depending on the color of the coat. Disqualifications: Wall eyes. Entropion or ectropion. The ears are set on at eye level or below, and not carried close to the head. The leather is long and quite fine and the ears curl in. They should reach to the nose without being stretched. Strong, not very long, with a little dewlap. The shoulders are well muscled, and moderately oblique. The upper arms are strong and close to the body. Straight with strong bone and muscle. The elbows are at the level of the sternum. The pasterns are very slightly inclined. Slightly longer than tall in proportion. The chest is broad, deep, and well let down. The ribs are rounded. The withers are well marked. The topline descends in a nearly straight line to the 11th dorsal vertebrae, and then rises slightly over the loin to join the croup. The back is firm and straight. There is a slight tuck up. Well muscled and strong, with the rear legs vertical and parallel. The thighs are long and strong, and the hock joint is well bent. The rear pasterns are quite short and almost vertical. Compact, tight and well arched, almost round. The nails are strong and the pads well cushioned. The tail is set on as an extension of the line of the croup. It is strong and at the base, and tapering. It is generally docked to slightly less than half its length, but a full tail is acceptable. It must not be carried higher than the topline. Short, close and glossy, finer and smoother on the head and ears. The skin is moderately thick and very supple. The mucous membranes must correspond to the coat color. They must never be black or have black patches. Pale orangy fawn roan, brown roan, white with fawn or brown ticking. Height at the withers for males is 23.5 inches to 26.5 inches. For females, it is 22 inches to 25.5 inches. A sustained and active trot with suppleness and lightness of movement. More than ½ inch over or under the size limits.